Salmon season is in full swing on the North Coast and it’s already shaping up to be one of the best our generations have witnessed. Limits have come quick, often and seem to be the rule, particularly in the Eureka area where fish are amassing to capitalize on massive globs of feed. Last year and this year are pretty equal, but it’s the best fishing we’ve ever seen. Even the old timers, who are 80, are saying it’s the best fishing they’ve ever seen. Around here, no one has ever seen anything like it. If you can get limits, 14 fish in 16 minutes, that’s ridiculous. I’m crediting the action to great ocean conditions, good hatchery production, lots of feed and good water in the rivers. Everything is right. The hatchery programs did a good job helping our salmon recover. Everything lined up. We have a lot of salmon around here. But, these fish we are catching are going to many rivers on the West Coast, not only local systems. 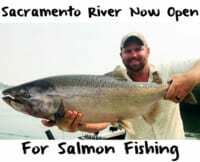 We get fish that are headed to the Columbia on down to the Sacramento and those headed to the Eel, Klamath and other local rivers. It seems like these fish are going all over. They come here to feed because of the massive amounts of bait we have in Humboldt Bay, and close to it. There’s a bait massacre going on here daily. The salmon are scarfing bait and getting bigger everyday. These fish around here can grow five to seven pounds a month. I don’t even think I could do that. I’m expecting some big fish late this summer. Consider we caught 30-pound fish in May. Think of what those fish will be in September. It’s crazy. With the amount of fish here now I don’t see how they put on any weight. Meanwhile, these fish are stuffed with krill, but I guess there’s more than enough to go around for everyone this year. As odd as it sounds, the salmon are kind of everywhere: basically, from Eureka to Trinidad. There’s like a 30-mile stretch of fish from Table Bluff (5 miles south of the Eureka Harbor Entrance) to Patrick’s Point in Trinidad. The entire area is loaded with salmon. As long as ocean temperature remains ideal they’ll stay. Salmon want to be in 50-54 degree water. Sure, there’s a ton of salmon. But, how big are they? Last year we had a ton of fish, but they weren’t this big. Last year there were a lot of shakers, which are fish under 22 inches, but this year there’s far fewer shakers. My biggest this summer is 32 pounds and there’s a ton of fish from 8-22 pounds. We have two-to-five-year-old fish around here. I’m thinking we’ll see them to mid forties soon. We should see 50s, but you never can tell. They’ll be here, but you don’t always catch them. Everyone on the North Coast is fishing bait. We are using straight bait with no cut in them with rotary heads. I’m using 40-pound mono Berkeley Trilene Big Game on my deep rods off the stern and 30-pound Power Pro on my downrigger rods. I’m trolling Pautzke Fire Brine anchovies daily. Normally, I have chartreuse and natural brined baits (sometimes green, too) always fished on a Mustad 7/0 Siwash hook. When running bait it’s important to pay attention to the watercolor. The color of the ocean dictates what color brine I use. Right now it’s dirty brown, but not really brown. It’s not mud color brown, which is why I’m using Natural Fire Brine. When the water gets dirtier, which can happen after we get a few days of wind, I’ll switch to the Chartreuse Fire Brine, and some green. It’s very important to brine your baits. It keeps them tougher, prolongs the life of them and makes them more durable. Also, if you brine them and they get nibbled on they’ll stay together. If you don’t brine them the anchovies get mushy and their bellies fall out. Brining saves you time and money and most importantly, they get bit more. Some days you can catch them on anything, however. Yesterday you could put a beer can in the water and get bit, but I never put a spoon or a plug on. Bait is supreme around here. If you want to catch numbers, you use bait. Actually, you used brined bait. Right now they are only 20-40 feet down. They are shallow, right under the boat. If the water warms in August, they’ll go down deeper, though. If it doesn’t they’ll stay in these depths. Generally, the rule is when the water temperature goes up, the bait goes down and the fish follow. Another factor to monitor is water clarity. If there’s clear water the fish are going to be deep. When it’s dirty the fish are normally up top. Our water clarity changes daily. The best color for salmon is dirty brown. We call it ‘salmon brown’. Salmon live in that dirty water. It holds all the bait. The baitfish and the krill hang out in it and the salmon go in there and eat it. A full moon can slow a bite as can a south wind, but otherwise we should be fine. August is normally nice weather with stable ocean conditions. August and September are the two best months on the North Coast by far. The best fishing is still ahead of us. Usually May is slow because the water gets cold and then it gets better and better. Right now you almost have to run to try and not find fish. The only thing that can slow us down is if the ocean gets really warm. We’ve had limits pretty much everyday this year and if conditions persist I don’t see that changing. Editor’s Note: Ocean salmon season in the Eureka area closes September 8th. 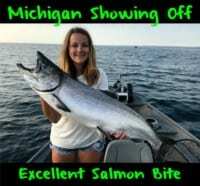 Anglers can keep two salmon per day, 20 inches and larger. Pautzke pro staffer Gary Blasi operates Full Throttle Sport Fishing. 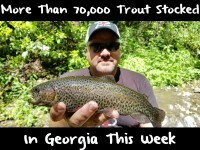 For more info on his Pacific Ocean salmon adventures please visit fullthrottlesportfishing.com.